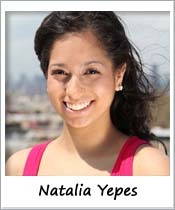 Natalia Yepes is a Queens, NY native that began dancing and training at the age of 3. Natalia is trained in ballet, pointe, modern, tap, jazz, lyrical, contemporary, hip hop, and Latin dance. She is a graduate of the Frank Sinatra School of the Arts where she had the chance to perform works from the Paul Taylor Dance Company, Michael Thomas, Marcea Daiter, and collaborated with Battery Dance Company and NYC Ballet. She received her B.F.A in Dance from SUNY Purchase where she received training from faculty with backgrounds in NYC Ballet, ABT, Ballet Hispanico, Martha Graham, Jose Limon, Alvin Ailey, and Mark Morris. She has taught and performed abroad in Burgos, Spain competing in an international hip hop competition and choreographing for Spanish dancers. She currently teaches all levels from ages 3 to adult.